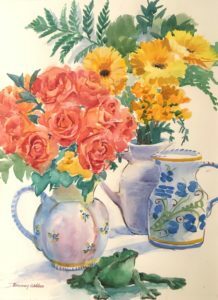 In these classes learn or review the steps of using transparent watercolor such as building up color from light to dark, painting flat washes, graded washes, layering transparent washes, and wet on wet techniques. Going from light to dark as you preserve the lights and highlights is key to watercolor technique. This approach will be discussed at length as well as studying excellent examples of this way of working. There will be still life setups to work from and photo referencing. Participants work at their own levels with individual attention given as needed. As the classes progress everyone will learn how to compose their own still life setups using a four part grid to transfer them onto watercolor paper. All levels are welcome but beginning contour drawing is highly recommended for this class. Painting in watercolor takes practice and patience, but be prepared to relax and have fun as we experience the joy of watercolor creativity. Material list available. Teaching Artist, Rosemary Webber, studied illustration and painting at Silvermine, Lyme Academy College, Parsons School of Design and New York Studio School. She graduated from St. Lawrence University, and worked as an illustrator for fifteen years, drawing in pen for newspapers and magazines (The Wall Street Journal, Forbes and The New Yorker, to name a few). Creating art from life is her passion. Since she terminated her pen-and-ink freelance work, she focuses her work now in watercolor and oils as her full time endeavor; she works both plein-air and out of her studio. Having been juried into more than 50 shows in the Northeast, her paintings have won many awards. She has been the judge for three shows in Fairfield County. Rosemary is an Associate Member of Lyme Art Association and is an Elected Artist at the Mystic Museum of Art.